My open webcomic project, http://www.peppercarrot.com is no longer fully hosted on this blog and got a new website to develop its community life. 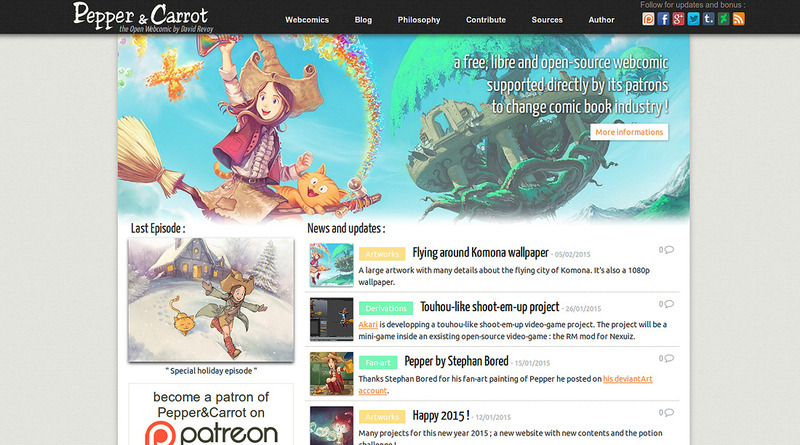 After a lot of effort at splitting all; the website is now online. Check the fan-arts gallery, and a fully illustrated 'Philosophy' page. Pages are also now faster, and I can host the 'Sources' directly. Feel free to send any feedback about it if you meet a problem or see an easy improvement. Challenge now: finish to draw long episode #6 'Potion challenge' , answer all emails and finish freelance artworks. License: CC-BY David Revoy, www.davidrevoy.com, 12 february 2015 . Although I would recommend setting up your CMS to automatically create a button for each article. A single button can only be clicked once per month so the more buttons you have the more people can give to you. @PrinzEnrique : Hey :-) Good to know, I 'm very new to Flattr ; sure, I'll try to do a better setup during the end of month to include on the CMS at the end of the episodes. Thanks for your support ! Awesome pieces! So inspiring your art work. I really appreciate your work.